With a good range of facilities, and prome location close to all of Salou's amenities, this impressive hotel is an excellent base for all the family. Offering high standards of accommodation and service, and a large free form pool. Stayed here at Hotel Villa Romana and I can honestly say the Mini-Club (which takes 5 years and above) is Brilliant. I let my 8 year old go and he enjoyed it, the food was good the entertainment was average, the service coverage was quite bad because the internet broke. Location was 5 star! Stayed here with my 14 year old son. I must admit that we were not expecting much from this hotel. However, I am pleased to report that Villa Romana exceeded our expectations on all fronts. The hotel was exceptionally clean, the food was outstanding and we found the staff to be friendly and helpful. The rooms are basic but well maintained and again and spotlessly clean. Even in peak weeks, we managed to find a sun bed somewhere in the pool area. There is no need to rise at dawn to find one. It does get very busy around the pool and the beds are jammed in but nonetheless beds are available. Portaventura and central Salou are about 15 mins walk in opposite directions. There is noise at night from nearby hotels but this didn't bother us as we were rarely in before midnight when the noise has to stop. It may be a point to consider if you have young children. Overall, the good points of this hotel far outweigh the bad, and I think it is well worth considering for a stay in Salou. We stayed in this hotel for 2 weeks in June and for most of the time we really enjoyed it. The hotel is in an excellent position for both the beach and the theme park, both being a gentle 10 minute stroll. The food was of a good quality and there was a good choice. We had some problems with the key card, which we had to keep getting reset but the worst problem was when they gave our room to another family while we were still in it on the last day even though we had booked a late checkout and checked with reception twice on the last day. We didn't see much of the entertainment in the evenings as we preferred to go out into town. A good hotel for families with young children. Good children's entertainment and the Mini-Club takes 4 years + off your hand for part of the day if you like. Staff were friendly and helpful. Location is 10-15 minutes from resort centre/beach but no hills to climb. Good indoor pool and sauna. Good mix of nationalities among the guests. You have to pay for you drinks with the evening meal which can rack up the expense quite a bit. When we first arrived at the hotel we were checked in quite quickly. We were given a second floor room at the side of the hotel facing another hotel. We had no problem with this as we got the sun in the morning. Our room wasn't very clean as there was lots of bits on the floor and the wardrobe doors were very marked. The hotel was kept very clean. The food on that first night was awful, but got much better as the days went by. There is a lot of pork served. Breakfasts were the same every day and were wonderful we couldn't ask for more. Always managed to get beds around the pool, there are some newer design ones which are the most comfortable. Daytime entertainment was good, we never stayed in to watch the evening shows. On the last day we had burgers from the poolside bar, my husbands was fine but mine spurted blood when I bit into it. Overall we enjoyed this hotel and would use it again. Just got back from Hotel Villa Romana and can honestly say, was the best family holiday we have had (out of 9). Hotel was very clean, staff constantly cleaning up around you day and evening. I am a very picky eater when abroad - food always hot and an exceptional choice, salads, soups, meat, fish and grill area nightly. Breakfasts good too, english and continental catered for, smoothies for kids, cava for adults! Only downside was that you had to buy a drink for evening meal (even water). Location is great - 10 mins from beach, theme park and shops, still quiet at night though. Entertainment was very low key, but that may be due to the time of year. Got involved with the nightly kids disco 9.00-9.30. Kids entertainer 'John' was brilliant with the kids (and adults). Plenty of places to go out nearby though - Titanic bar 5 mins away - happy hour every day and good pub food. Good pool with lifeguard in attendance - water a bit cold, but I like that. A great family hotel with no signs of drunks or bad behaviour, respect is requested after 11.00pm for other guests which was upheld every night. We all made lots of new friends during the week (kids included) and are looking to book again for next year. This is one of the best hotels we have stayed in. There are cleaners everywhere. Rooms tidied everyday, beds made everyday. Food was lovely, different theme nights. Hotel is about a 10 minute walk to the beach but the hotel is in a quiet area and come 11.30pm all is quiet. (Our room was at the back of the hotel facing another hotel where entertainment was on) The hotel staff are wonderful, always happy to help, nothing was too much trouble and they love kids. The entertainment we did see was fine, the kids disco was very popular, maybe something to do with the lollys they hand out! This is the first hotel where there has been no fight for sunbeds, they were in ample supply, we always got a spot around the kids pool. There are approximately 10 large umbrellas around the pool. Would definately recommend this hotel to anyone, we are looking to booking again for next year. 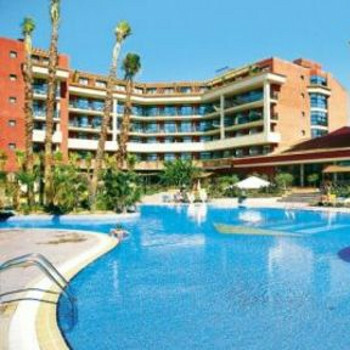 we went to Salou on a recommendation from our agent in July. Told it was family friendly, great beach, 4* hotel etc. On surface this is what it is, but we were very dissapointed to the point that we wanted to come home after day 3. the Hotel is very clean and does have lots of things going on but i think we went at the wrong time, could never get a sunbed around the pool, pool was very crowded. The buffet dinner seemed to be more "fight or flight". My daughter loved Mini disco though - it was the highlight - which thinking about it is a bit sad really. The beach is lovely, but it was so busy could never actually find a decent space. The area is full of English pubs, english grub and tatty souveneir shops. Unfortunately it really wasnt our scene, like to sample the country that im visiting, not have "blackpool" follow me. The only good part was taking the train to Barcelona for the day, but even that was a hard slog, we had to stand up for the first 30 mins (with a 3 yr old and buggy it wasnt fun). If you are Ok with a place that feels like back home and you can easily find burger & chips and watch footie, then this is for you, but if you travel abroad to taste/do different things....go elsewhere. Hotel was very nice, was clean, friendly, food was always nice and lots of choice. bedrooms were a nice size, maid service was everyday and always left clean. the restaurant staff were very friendly. the hotel entertainment was excellent best i';ve seen in a hotel, we see some acrobats and different acts. mini disco every evening for the kids, a mini kids club which is free 4-5pm everyday, face painting every day.